Castle Comfort from Stoke on Trent have supplied more of these Economy Lightweight Transit/Wheelchairs over the years than any other mobility product. We will soon be having special Castle Comfort Wheelchair Warning Stickers courtesy of your local Wheelchair Friendly Centre. You got a wheelchair ? To many, the thought of a wheelchair, as with any mobility product, can worry, frighten and even cause depression. Well, a Staffordshire-based company which originates from Wolstanton Newcastle under Lyme has done its bit to change this fear. Wheelchairs can be fun - many of us are scared about having a laugh about many things like a disability, race or religion for fear of offending. Being humorous does not need to be offensive, Yes, we need to be careful - but most wheelchair users want to be treated the same as everyone. Ask yourself and others this question - and the answer speaks volumes. 'You stop a person who is pushing a wheelchair for directions. 'Who do you look at and/or ask? .... 'The wheel chair user or the pusher?' Most honest answers will be 'the attendant.' And of course that shouldn't be the case. Nor should a joke not be cracked, or a bit of fun made because of the presence of the users of wheelchairs, or in fact any mobility products. The logic behind this was to convince people that that what is needed in life is essential and laughing about it is the only way. nobody wants a wheelchair - no more than wanting a plaster if you cut your finger .. but the consequences of not doing the necessary are worse - and will cause trouble and inconvenience to caring family and friends. Life is short and temporary visit to this world and laughing about both the best, and where possible - the bad things, can help us get by. 'Laughter is the best medicine' is something we all know - but at Castle Comfort until we were joined by a very special retired doctor, did we realise just how true this is. His constant enthusiasm and will to still help others is seen over and over again. For example the Newcastle under Lyme Salvation Army Christmas appeal - to help hundreds of not so lucky children get a nice present was reported by the Stoke Evening Sentinel. Read it here. And pictured below, officials from the Salvation Army and Jan Williams, who is mum of Stoke on Trent star Robbie Williams - meeting the best Santa ever, FATHER CHRISTMAS DOCTOR NEIL STIRLING! Thanks to the Stoke Sentinel for covering the story here. Doctor Stirling is now in his retirement enjoying life to the fullest at Castle Comfort - and we think you will enjoy reading about his life on his very own website. Highlighting the friendly rivalry between Stoke City and Port Vale - see what happened when a flying STAIRLIFT landed at Vale Park, here. The repairs to the Stoke on Trent 'D' road took so long - the Staffordshire Highways officials deserved some banter. Drive here. Students from the Universities of Keele, Staffs and Oxford sought the OK to use the copy written cartoons in projects. Also companies and organisations from all over the world have sought permission to use some of these masterpieces but here in fact some fees were negotiated that has benefited the Castle Comfort good deeds fund. This fund has now accumulated over the years over £50,000 - see Wikipedia, and another source of donations has always been the generous public of Stoke on Trent, Newcastle under Lyme (and elsewhere) who, when borrowing a wheelchair for a while have made a voluntary donation. The official hiring out of wheelchairs is never practical or economic due to insurance and other red tape, so the complimentary loan of one has always made sense. 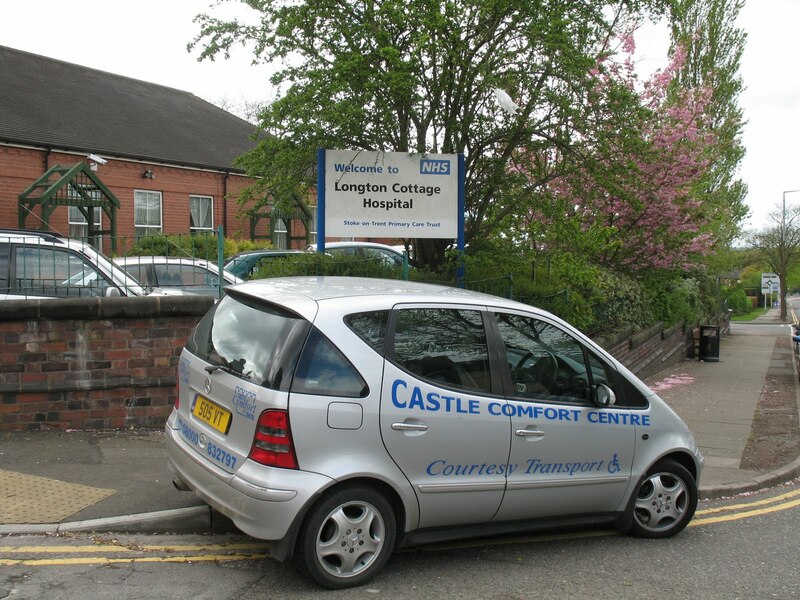 Castle Comfort that this wheelchair has been, in terms of quantity of units sold - the most successful product since this this Staffordshire company was formed. In terms of maintenance and after-sales looking-after it requires no attention. It is probably the lightest wheelchair available in its price range - weight just 8.6 kilos or 19lbs (or 9 bags of bags of sugar.) It folds away to next to nothing and be placed into the boot of a car or on the back seat with just one hand. It has affectionately been known as the 'boil in the bag' as it comes with a zipped carry bag which means when not in use it can be packed away for coaches or aeroplanes and discreetly carried with ease. It is a 'transit' product which means the user is easily pushed along by eager friends or relatives - and the brakes enable any unlikely emergency stops! There is a seat belt- though not many people in practice bother buckling up and whilst the seat is supporting, yet soft and comfortable, it can take a standard wheelchair cushion which the popular Newcastle under Lyme firm stock, as well as scores of other items dispatched daily. Now for one of the best bits - one of the many advantages this transit wheelchair will one day be copied by world-wide makers of wheelchairs everywhere. THE FRAME OF THE 'BOIL IN THE BAG' IS CURVED AT THE FRONT. What does this mean? Well just ask any regular user of a wheelchair what happens when they to try and sit at a table in a cafe or pub or restaurant. They have to sit side on, because a standard wheelchair with its squared off frame means it won't go under the table. So, even after we have removed any stigma or embarrassment about using a wheelchair, if the user prefers to look like every other younger or able bodied person at the table - then this product does the job beautifully! See if such a fact is mentioned in the world authority's definition of a product going back to the sixth century - the wheel chair - Wiki ! 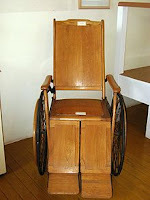 You'll learn too that only as far back as the early 20th Century - wheelchairs were made in not lightweight wood! Now for the best news. A wheelchair weighing similar or less would normally be made of titanium and cost several hundred pounds. Such products are the usually self propelled ones (driven by the user) and for daily consistent use. Castle Comfort's famous lightweight wheel chairs which has become famous for enabling thousands of people to enjoy shopping trips, days out and holidays safely and without causing inconvenience to others. It has a recommended price of £375. You will find that from time to time by being on our mailing list that a discount voucher can be used which can reduce this by £50. Making the cost just £325. If you live within 25 miles of the HQ at Newcastle under Lyme on the border of Stoke - it will be delivered without cost. The discount is now extended to all readers of this blog - so when phoning or enquiring by email or by using the reply coupon on Castle Comfort's website ....... just quote 'wheel chair blog' and the price to all is £325. A small delivery charge may be made to other areas - and on top of all this if a free home trial and demonstration is needed before deciding- just mention it. The transit chair wheelchair can make a perfect present for Mum or Dad, Grandma or Grandad – in fact a surge in sales is always seen around Mothers Day and Fathers day and of course Christmas. See full details of these routes and areas covered on the chairs and beds blog, but in brief anyone living in Stoke on Trent, Newcastle under Lyme, Staffordshire, and nearby towns and villages such as Congleton, Macclesfield, Stone, Prestbury, Alderley Edge, Leek and Stafford can have a transit chair often the same day as order. In addition Castle's regular delivery trips to Manchester, Birmingham, Derby and Leicester and Nuneaton can be used to have a 'boil in the bag' at your doorstep in no time. Also, the renowned mobility scooter the Elite Traveller Plus is also offered this year by Castle at £1475! (RRP(£1875) If you want to have a transit chair brought to you - just ask about having a new vehicle. See it here. on 01782 611411 and as ever see the main website.or Freephone 0800 0832 797But, if you prefer use the coupon. stairlifts grantsto see how Castle Comfort ended up on the BBC News when they visited that particular town. Cornwall, Devon, Somerset, Dorset, Hampshire, West Sussex, East Sussex and Kent. The Wheelchairs to Lancashire Run. Includes Manchester, Wigan , Bury, Stockport, Rochdale, Liverpool, Birkenhead, Preston, Blackburn, Burnley, Blackpool, Southport, Morecambe, Lytham St Annes, Lancaster, Fleetwood and Colne etc. The Shropshire Wheel Chair Run. To the Welsh Borders visiting Bridgnorth, Shrewsbury, Telford, Newport, with often extended runs to incorporate Powys, and the Swansea and Cardiff areas. Birmingham Wheelchair Run. As far as northern Home Counties ie Hertfordshire, Bedfordshire, Buckinghamshire & Berkshire. Covers Northampton, Aylesbury, Milton Keynes, Bluebelltown, Corby & Kettering. Mother’s Day & Father’s Day. 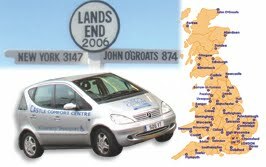 Anywhere in England & Wales with 14 days notice. Hospital discharge cases receive top priority. NB Castle Comfort Directors point out that when an emergency delivery has been arranged at short notice people have often insisted on paying extra even though no charges are made. In all cases any such funds are put towards the Good Deeds fund. Such gestures are not necessary but nevertheless appreciated. No CC team member will accept 'tips' under any circumstances. 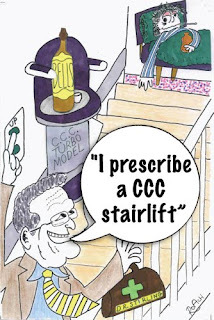 I really like the cartoon with the Stairlift carry a "medicinal bottle of whiskey" to The user. I have seen Dogs go up and down on a stairlift, dinner trays, Laundrey baskets...cats...as well as the usual young family members. The Light weight Wheelchaire looks like godsend, When mum had her stroke 8 years ago, we struggles with bulky heavy wheelchairs, but combined with the price and the easy handling this looks Ideal. Although that didnt stop someone stealing mums wheelchiar....from the pub where mum and dad were having a meal out. It was returned to the pub the following morning with a note of apology, saying it was the only way he could get his drunken mate home! At least they returned the wheelchair! That would have been avoided if Mum could have stayed in her chair, so the curved arms are a briliant idea. A wheelchair that doesn't have punctures - Fantastic ! No searching round the bike shops of Cheshire for puncture repair kits. Kind comments - all of you. We think the design of this wheelchair that enables it top go under a table is a bit of a fluke. We are contacting all wheelchair makers world-wide with our findings. this blog. It shows how well you understand this subject. Bookmarked this page, will come back for more. We get customers from around the world, though you must be our first Indian enquirer. If ever you are visiting England, (we are located midway between Birmingham and Manchester) you are most welcome to visit our Castle Comfort Centre showroom. You can see the lightweight wheelchair we sell as well as adjustable beds, stairlifts and riser recliner chairs. Only relevant comments will be shown. All links are stripped from comments by default.